Author Type if a hand-crafted brush font that comes with a stylish hand-lettering design. It features a unique look that will help personalize your business card designs. The font features both uppercase and lowercase letters with swashes and multilingual support. Southampton is a handwritten script font that’s perfect for designing a creative business card or adding an elegant signature to your business card design. It also includes lots of glyphs, swashes, and a web font version as well. A yet another creative script font with a professional design. This font features a unique design that’s been handcrafted using markers. It includes both uppercase and lowercase letters. This unique handmade font is ideal for showing off your creative side in the business card design. You can use this font to design cards for creatives, artists, fashion designers, and graphic designers. Bouquet font comes with a mixed design of both modern and classic elements. 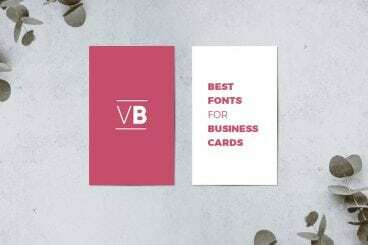 It’s perfect for designing business cards for all kinds of professionals and businesses. The font includes swashes, ligatures, and multilingual support. Matilna is a script font featuring a modern brush style design. It comes in two different versions, a clean typeface and a rough typeface. You can use both to design unique business cards. This bold modern script font will fit in nicely with many types of business card designs. It comes in multiple variations, including swashes and a web font version. This elegant font will make your business card signatures and names look as if they were written by hand. The font comes with regular and slant characters along with ligatures and multilingual support. Matauro is a creative brush font that features a unique script-style design. If you’re working on a creative and an uncommon business card design, this is the font you’d want to use. Another signature style script font featuring a natural flowing design. It’s perfect for adding a cool signature to your business card or making your name look more professional. Morton is a family of fonts that come with a modern grotesque design. The font is available in 9 different weights to let you choose the right thickness to match your design. This stylish font features a creative and a curvy design that will add a unique look to your business card designs. It’s perfect for designing luxury brand and fashion design business cards. Helios is a modern font featuring a bold futuristic design. It’s ideal for designing creative and unique business cards with a personalized look. The font includes uppercase letters with many alternates. Modeka is an elegant sans-serif font that comes with a creative design. It will fit in nicely for many types of business card designs, including fashion brands, small businesses, luxury brands, and corporate businesses. This font comes with a beautiful modern design including 4 different styles, including light, regular, bold, and black. The font features a stylish 16-degree angle throughout its characters that add a unique look to this typeface. Kiona is a minimalist and a modern font that comes with 4 font weights. It features a simple and a clean look that will give a modern and a professional look to your business cards. This font comes with two different styles, a script font and a sans font. Both typefaces feature handcrafted designs and they will be a perfect combination of a modern business card design. Mutiara is a bold font with a vintage design that comes with 4 different styles, including slab, bold, and rough. It also includes 54 alternate characters and multilingual support. Shintia is a beautiful script font that’s ideal for adding a feminine touch to your business card designs. It comes with 247 glyphs and OpenType alternates. This font features a set of stylish disruptive alternate characters that will let you make your business cards look more creative and add a personal touch to your designs. Airy is a unique font that comes with a very creative design. It’s perfect for making business cards for creative designers, graphic designers, artists, and many other professionals. This font comes with a retro vintage design that will make your business card designs travel through time. The font comes with 3 different styles. Exodar is a modern typeface with a futuristic design. It’s perfect for crafting business cards as well as designing logos. The font features both uppercase and lowercase letters with multilingual support. Starway is a modern sans-serif font featuring a stylish design. This font includes both uppercase and lowercase characters as well as a set of special characters. Luna is an elegant and a minimalist family of fonts that has a design perfect for luxury and high-end brand business card designs. The font is available in 5 different weights. This stylish monospace font features a technology inspired design that makes it perfect for designing business cards for coders and developers. Leoscar is a serif font that comes with a unique design mixed with classic and modern elements. It includes all characters with numerals and punctuations. Centauri is a space-themed font that you can use to design business cards with a futuristic design. The font comes with lots of alternate letters and characters as well. Hamlin is a minimalist font that features a geometric-based design. This font includes 4 different weights and it’s perfect for designing professional business cards that stand out from the crowd. Metropolis is a modern serif font that comes with an elegant urban design. The font design has been inspired by the 1927 Fritz Lang movie of the same name. Amelia is a stylish calligraphy font that you can use to design elegant business cards for professionals and creatives. It includes a web font version as well. This creative and fun font comes with unique alternate letters featuring attractive geometric shapes. It’s perfect giving a unique look to your creative business card designs.